When you work with me you can expect me to be a mental health counsellor drawing from many years of experience in healing the pain of depression, anxiety, trauma, anger management and grief. I work with relaxation techniques, mindfulness, cognitive behavioral, spiritual enquiry, motivational interviewing and other modalities as needed. For those of you who want to work in a psychonaalytic way you can expect the following. When I work with you, you work with your dreams, your art and associations for an hourly session weekly or bi-weekly as needed. 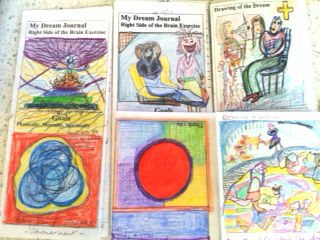 I use artwork to illustrate your dream and look for a rhythm showing the inner conflict displayed in the dream. I have developed a dream leaflet into which you put your dream, your personal dream illustration, your prayers, your goals, your issues, and your new focus for yourself. There is space there to place a message to yourself from your dream: that “opened letter to your self.” This work will bring struggle, satisfaction, laughter and energy to you. This kind of attention brings our what is most important and what is most painful to be resolved. The dream links into the unconscious, bringing the possibility of transcendence, through the symbology. Bringing together the opposites has the happy knack of curing what is showing up in your body as pain or disease. It focuses on blocked energy, it gets under depression, and releases energy into a new freedom, whatever stage in life you are facing. On this pilgrimage of life, there comes a time to look into the Dark Woods and go where there is no path, to find yourself. The possibility of stimulating the deepest layers of the psyche, of understanding soul is there, through a walk through your own dream, your personal psychology and symbology. Representation of left and right side of the brain. I had a feeling that my face spread out onto shards and came back together differently. I have recorded and studied dreams since I was in my late teens and have worked professionally and personally with dreams for the last forty years in therapy and in groups. KNOW THE KNOWN AND THE UNKNOWN. START NOW. A new way, an ancient way of making your way to “the way” for you. Another tool we can use during a counseling session is the MARI Card Deck. To learn more about this intuitive technique, click here.